Cherry jam is a delicious treat that contains vitamins C, B2, P, folic acid and iron. It is best to get jam from the late varieties of cherries. It can be prepared with seeds or without them. - 1 kg of sugar (the amount can be increased according to your taste). Clean the berries from leaves and sticks, wash them. Remove the stones from the cherries with the help of special devices. Cover the berries with half the norm of sugar and leave overnight. Cherry will give a lot of juice. In the morning, put the cherries with sugar over medium heat and simmer for 15 minutes. Turn off the fire and cool the jam. Drain all the syrup in a separate bowl, add remaining sugar, stir well and cook it on medium heat. A pot of berries, leave aside. Check back later to see the cherry syrup on density. Pour into a saucer of cold water and squeeze it a drop of syrup. It should not run if formed of a thick drop of syrup is ready. Pour into the prepared syrup to the berries, stir and pour into pre-prepared washed and sterilized banks. When cherry jam cools, it becomes dense. 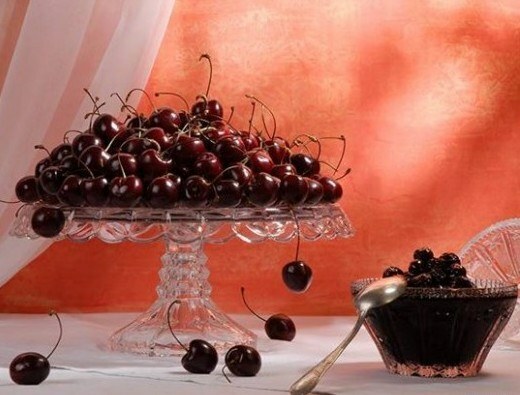 Cook of cherries with pits thick fragrant jam. Sort and rinse the berries. Boil syrup from 1 Cup water and the entire quantity of sugar. When it becomes transparent, put the cherries, stir, bring to a boil and turn off the heat. Leave the jam to cool down, then turn on the heat, bring it to a boil, remove from heat and wait until the jam cools. Put jam on fire in the third (last) time and cook it until tender. Define readiness as follows: drip a drop of jam on any cold surface (spoon, saucer). If the drop does not spread, it is ready. While cherry jam is cooking, wash and sterilize jars. Lay them in the hot jam and close the sterilized lids. Put the jars down close it with something that holds heat (for example, Newspapers and thick towels). After an hour remove the "insulation", flip banks, wait for complete cooling and put them in storage.